Leaving our Med mooring spot in Ormo Abelike went perfectly, there was barely any wind which helped a lot. As soon as Colin untied the windward stern line, Emerald gently moved forward as the taught anchor chain obeyed the laws of physics (Hooke’s law for those that care) and returned to its relaxed state and soon we were clear of our neighbours and could swing freely without worrying about taking someone’s bow off. This can’t be said for some of the other boats in the anchorage. One boat on leaving managed to snag three other boats’ chains; two Med-moored and another that was swinging at anchor. It took some time to sort out and as the culprit left the anchorage the victims were still sorting things out for ages afterwards. Another boat snagged their neighbour and did the right thing – taking a line around the snagged anchor and towing it out to a suitable spot to drop it again. Unfortunately when the victim pulled the chain in tight the anchor dragged so they were left having to remove the stern lines, motor out, drop anchor and sort it all out again. This Med-mooring lark is a bit of a palarver in my opinion! While we were there from midweek onwards a whole load of Swedish boats began to arrive and on the Friday they had a midsummer eve party with a fire on the beach (non Swedes weren’t invited). A Sunsail flotilla also arrived on the Friday and they all tied together down the head of the bay. Once they all left there was a reasonable amount of room but it had begun to get a little crowded on the Thursday and Friday with a Swedish neighbour a bit too close for our liking. It seems we chose a popular bay to moor up in. Maybe because it was so sheltered from the wind; when it blew strong from the north it passed right over the top of us with barely a ripple on the water. An easterly set up a swell than pushed it’s way in and down the middle leg of the bay; however we were protected by a 43 foot superyacht providing a convenient wave break by the entrance. One day there was a more southerly wind but with no distance to build up a fetch it wasn’t a problem. Other than worrying about another boat snagging our chain we had a lovely, relaxing time in Meganisi after all the hard work of the previous two weeks of painting the decks and cleaning the hull. There was plenty of time for practising our instruments, cooking nice food and generally chilling. When we wanted a bit of exercise there were lots of places to walk with dirt tracks around the coast and empty roads inland through olive groves. The island was alive with crickets and grasshoppers; as we walked along we left a frenzy of hopping in our wake. 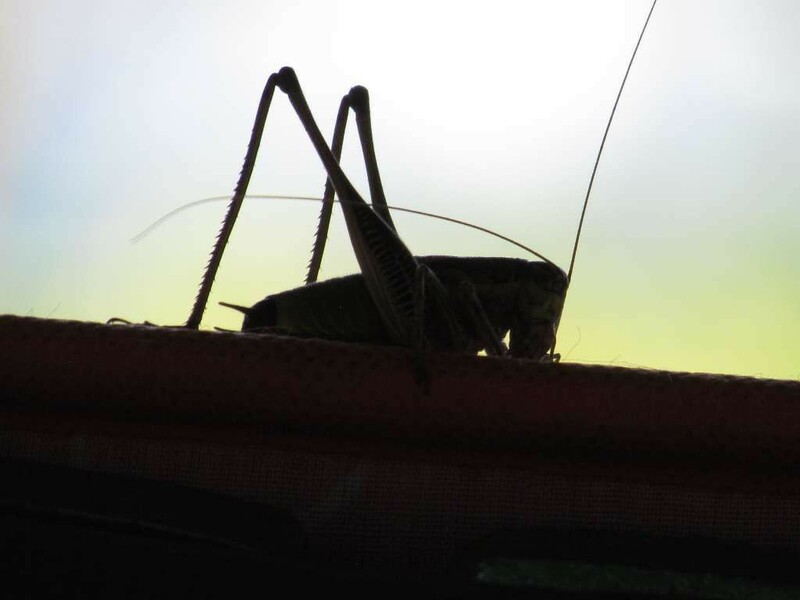 (The difference between grasshoppers and crickets is that crickets tend to have long antennae, grasshoppers short. So I’m guessing this beastie is a cricket). Their hop direction control wasn’t the best and a few made contact with us and the foliage around. One poor thing seemed to only be able to hop upwards where a sturdy piece of grass would knock it back to where it started; after several attempts a helpful gust of wind moved the grass and the hopper finally made onwards progress. 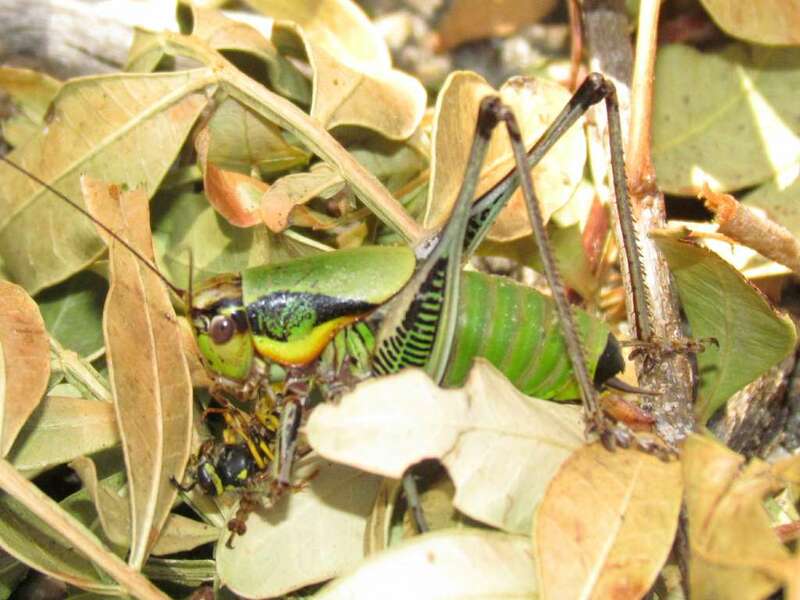 We saw many large, green and yellow crickets, nearly 2 inches long that turned out to be carnivorous as we watched one chow down on a still alive wasp. The water was crystal clear and shoals of baby fish darted around the boat. Finally we were able to swim without worrying about what might float along as we had in the soupy green water of Vlicho. The afternoons got hot and it was wonderfully refreshing to hop in for a few laps of Emerald. 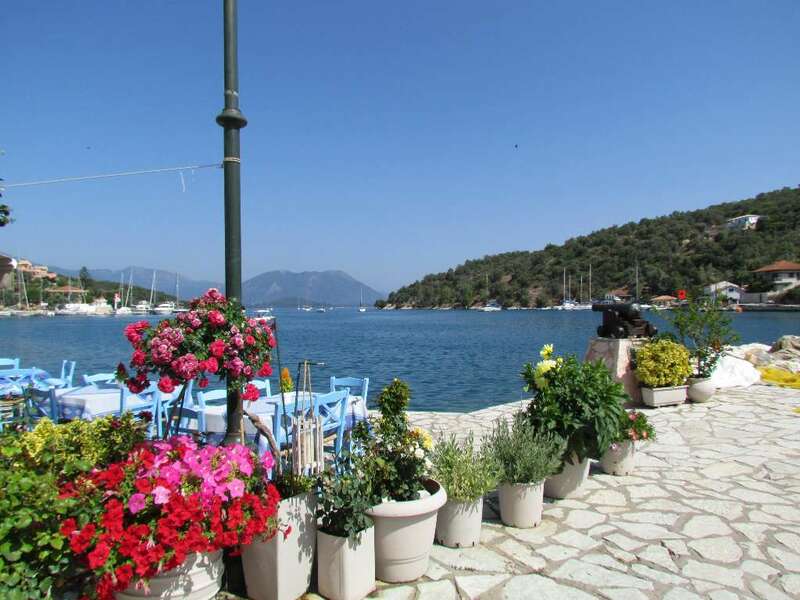 The village of Vathi was a 15 minute walk from the head of the bay. A path through the scrub led up from the pebbly beach to a road which continued on up. Steps then led down into the village. It is a pretty village with stone cottages and a long expanse of quay running right around the edge. We were told that mooring on the quay was free and on the western side we saw lazy lines. There weren’t many spaces available and several boats looked like they never moved away. Bars and restaurants lined the quay with slightly higher prices for drinks than we had found elsewhere. We spotted 3 mini supermarkets with plenty of fresh veg and there was also a bakers. There are many stray cats in Greece and I felt sad to see so many pregnant ones roaming around adding to the problem. 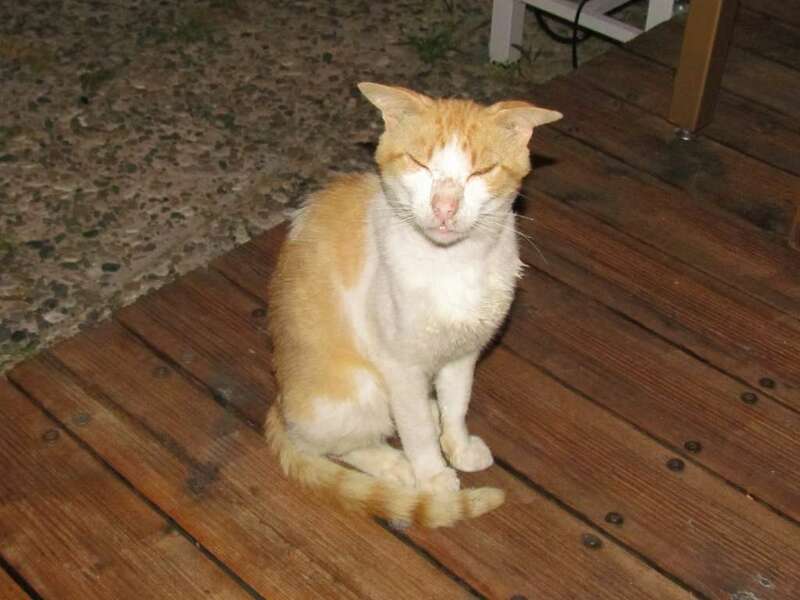 We made friends with a skinny, scruffy ginger tom who visited when we went for a meal at the Rose Garden restaurant (a very good value and delicious meal at a friendly family run place). The tops of his ears stuck out sideways, he had a slightly dozy look and he’d obviously been in the wars. Unlike the other strays who skittered away as soon as a hand went out towards them, he sat and allowed us to give him a neck and ear scratch which he obviously enjoyed. We shared some of our dinner with him and felt a little forlorn as he watched us leave at the end of the evening. Emerald luckily didn’t have any uninvited furry visitors whilst we were there; we hadn’t put any rat blockers on our lines so there was a chance that Roland the Rope Walking Rat might tightrope his way across to us. I did block up the anchor chain hole just in case and made sure the open hatches had nets across to stop any gate crashers getting beyond deck level. We saw other boats with various designs of rat stopper – large circular discs with holes in the middle placed on the lines, lengths of pipe on the line that in theory will spin as the rat walks across and dump them in the water and we read about an electronic stopper that emits an annoying noise only rats can hear. We’d be interested to hear about any readers who have had uninvited furry guests and what methods they use to stop them visiting again. Maybe a cat would be a good idea!